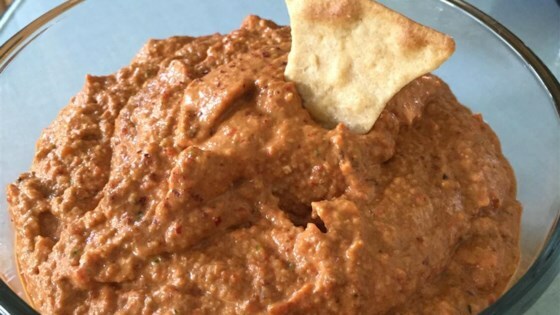 "This is a traditional hot pepper dip/spread from Aleppo, Syria. It is quite popular in eastern Mediterranean dishes, especially Turkey. This is very traditional and authentic, and I am sure you will enjoy! Serve with traditional Turkish pide (or your favorite flat bread) or spread on crackers." Place the bell peppers with cut sides down onto the prepared baking sheet; roast under the preheated broiler until the skin of the peppers has blackened and blistered, 5 to 8 minutes. Toast the bread slices in a toaster and let cool; place into a resealable plastic bag, squeeze out air, seal bag, and crush with a rolling pin to make crumbs. Transfer peppers to a bowl and tightly seal with plastic wrap. Set aside until the skins of the peppers are loose, about 15 minutes; remove and discard skins. Mash the peeled peppers with a fork. Combine mashed peppers, bread crumbs, walnuts, lemon juice, Aleppo pepper, pomegranate molasses, garlic, cumin, and salt in a food processor; pulse the mixture a few times to blend before running at lowest setting. Slowly stream olive oil into the pepper mixture as it blends until integrated completely; transfer mixture to a serving dish. Sprinkle sumac over the mixture to serve.